Woodland Hills, California (March 2, 2011) - Fighters scheduled to do battle on this Friday's WARNER CENTER WAR 3 card presented by Art of Boxing Promotions in association with Bash Boxing, got together with the West Valley Boys and Girls Club of Canoga Park. Lightweight Raymundo Beltran, heavyweight Andrey Fedosov, cruiserweight Deon Elam, welterweight Hugo Centeno Jr. and members of the "KnockOuts For Girls" non-profit organization were on hand to give the children encouragement and inspiration. The message being delivered was "Stay Active, Eat Healthy and Learn to Box". 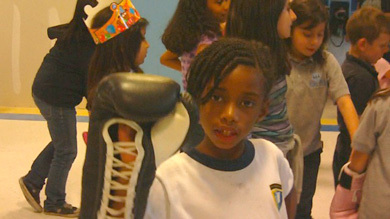 KO4G.org was formed by a group of female boxers who wanted to inspire girls and other women, while passing on to them the health and fitness benefits of boxing. KO4G.org also relays the message of empowerment and confidence gained from boxing, and the structure and discipline it added to their lives. Only 200 tickets remain for WARNER CENTER WAR 3 set to take place on Friday, March 4, 2011 at the Grand Ballroom of the Warner Center Marriott in Woodland Hills, California. Tickets can be purchased online by going to www.warnercenterwar.com or by calling (626) 388-8888. Doors Open at 7:00 pm, First Bout is at 7:30 pm.